Fracking under the radar? is a new leaflet about acidising from The Weald Action Group (WAG). WAG is an umbrella group supporting the many community groups across the South East who oppose the growing presence of the oil and gas industry in the region. They all share concerns about the techniques this industry proposes to use in as yet untapped, unyielding sections of the geology under our feet. The leaflet explains the oil or gas extraction method known as ‘acidisation’ or ‘acidising’, which, like fracking, is a ‘stimulation technique’ designed to release oil or gas tightly trapped inside the pores of rocks. While fracking is used to crack open shale, acidising is used to dissolve passageways through limestone or sandstone. Acidising uses far higher concentrations of chemicals than fracking, and brings similar risks for local people, animals and the environment. This short leaflet, intended mainly for local people and councillors, explains in simple terms how acidising works at different strengths and pressures, and why this kind of oil exploration will give rise to a very large number of wells across the South East. 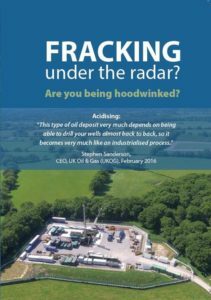 To order copies of ‘Fracking Under the Radar‘ leaflets, please contact info[at]wealdactiongroup.org.uk.